“For over a century, Musical Excellence has been a tradition at St. Stephen’s and is a marvellous source of inspiration, spiritual refreshment and enjoyment”. The founding fathers of St. Stephen’s intended music to be an important part of the life of the Church, and when the Church was completed (apart from the tower) in 1898 they had installed a superb organ by Hill (who was considered to be the Rolls Royce of organ builders in the 1890s) and had appointed as organist, the young Henry Holloway (the assistant Organist of Worcester Cathedral). This was in a Church which had only had it’s foundation stone laid in 1881! Henry Holloway served St. Stephen’s as Organist until 1930 (when he went in semi-retirement to be Organist at Christchurch Priory). During this time the choir flourished. Holloway was also a great musical figure in the town and was a friend and supporter of Dan Godfrey (the founder of the BSO). When Holloway moved to Christchurch Priory, after 36 years at St. Stephen’s, the Church appointed the 27-year-old assistant Organist of Rochester Cathedral as its next Organist. Percy Whitlock, at the time was considered of the brilliant young organist and composers of his generation, and much of his finest organ music was written during his years at St. Stephen’s. His reputation has steadily grown since his untimely death (in 1946) and there are few organists in the Anglican tradition who do not include his music in their repertoire. 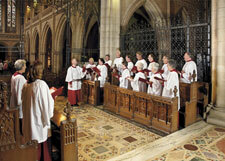 He also wrote some superb motets, as well as much other choral music, which is part of the “Anglican Repertoire”. Whitlock was enticed by the prospect of becoming the full time Borough Organist and so in 1935, resigned from his church position to concentrate on his work at the Pavilion. However, St. Stephen’s again enticed a young and extremely talented organist, Cyril Knight, to lead the music. Cyril was Organist from 1936 until 1982 (with a ten year break from 1966 – 76, when he was at St. Peter’s). He was a very influential musician in the town, and was chorus master of the Bournemouth Symphony Chorus. In the post-war years, his choir at St. Stephen’s had a great reputation and people still talk of the thrill of coming into the church during evensong and hearing the boys choir. In the mid 1960s, the tradition of a boys choir ended, although the musical standards were maintained with an adult choir of experienced singers. In August 1982, Cyril Knight died whilst still in the position of Organist, and was succeeded by Ian Harrison, who was a regular worshipper in the church. Ian has served St. Stephen’s as Organist for fifteen of the past twenty years (with a break from 1988 1993). During these years, the core repertoire of the choir has expanded to include Eucharistic settings from the renaissance, classical and later twentieth century.